Middlesbrough manager Aitor Karanka has said his side's strong form and good health is "not a coincidence" after they went top of the Championship. 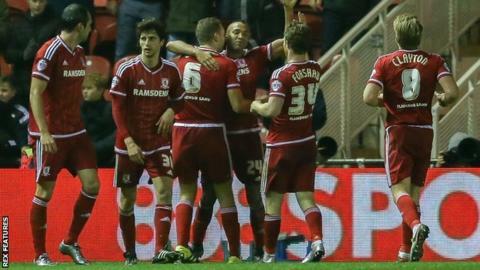 Emilio Nsue scored the only goal as the Teessiders earned a narrow victory over promotion-chasing Burnley on Tuesday. Boro are unbeaten in five league games, while defender Alex Baptiste is their only long-term injury absentee. "We have an amazing squad, I have an amazing staff - I have an amazing medical staff," Karanka told BBC Tees. "It's not a coincidence. We have a very good atmosphere in the changing room and a very good recipe with everybody working together." Middlesbrough are also likely to be boosted by the return of Australia centre-back Rhys Williams, who will play in an under-21 game this week as he continues his recovery from a torn Achilles. Williams was hurt in Boro's FA Cup win over Barnsley in January, as he made his first start since suffering the same injury in a league game against Wigan 12 months earlier.